The winner is Spanish photographer Miguel Candela for his exhibit on Bangladesh's Brothels. Photograph by Miguel Candela. Julie's father was handicapped after a traffic accident. Her father was the sole bread winner. Her family hasn't been the same since then. She agreed to work in the brothel to help out. Brothels documents the "intolerable contradiction that is the everyday life" of prostitutes in rural Bangladesh. "Society has forced them to live in darkness while men love them and hate them in equal measure, demanding their services while trying to get rid of them permanently," said Candela. Candela, from Spain, has traveled extensively and spent extended periods in various countries in order to photo-document the people and their community way of life in Mali, Nepal, Kenya, the Philippines, Bangladesh and across China, and in his current base of operations in Hong Kong. Photograph by Brian Driscoll. Fatin El Sayed Mohamed, 36, from Agouza, Cairo, was abducted in Tahrir Square, September 2011, as she was selling tea. Political Prisoners of a Revolution is an ongoing project that explores the lives of Egyptians who have been affected by extensive prison sentences for their political views/actions. Some victims have remained in detention for up to a year, along with serious violations of their human rights, acts of torture, as well as sustaining inhumane conditions. Since January 28, 2011, the Security Council of Armed Forces (SCAF) has detained thousands of civilians without any access to lawyers or opportunity to review the evidence against them. "My aim is to give voice to the voiceless among political prisoners and their families in and outside of Cairo, Egypt. These images are an attempt to portray and uncover the intimate stories of some of the individuals, and bring greater awareness to the thousands who go unknown for weeks, months, and possibly years held behind bars," said Driscoll. Driscoll is a documentary photographer currently based in New York City. His humanistic interest in photography began in his early 20s after exploring Central America and South Asia. He is a recent graduate of the documentary and photojournalism program at the International Center for Photography. He is recognized as an Emerging Talent by Getty Reportage and a nominee for 2012 PDN 30. Photograph by Leslie Alsheimer. "Girls Laughing." 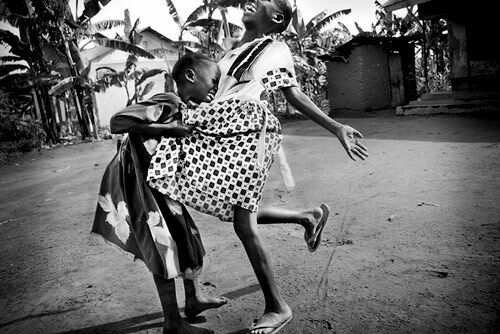 Following malaria, HIV/ AIDS pandemics and decades of brutality at the hands of Joseph Kony and the Lord's Resistance Army (LRA), survivors live on embracing life and rejoicing not because of their circumstances, but in spite of them. A Moment in the Glass: The Secret Life of Uganda's Daughters documents the contradictions of Uganda. "A home: a place to rest, to eat and to be. The dirt floor, the crowded rooms, the lantern, and the outhouse do not detract from the fact that a home is a home. Over 1.4 billion people live in extreme poverty around the world. They live without the thought or idea of the luxuries experienced in the developed world. Yet these Ugandan faces tell another tale. Their faces show life and celebration through the joy, pain, and love of everyday living," said Alsheimer. Alsheimer, author of Black and White in Adobe Photoshop CS4 and Photoshop Lightroom, is an internationally published and award-winning photographer and author. She is most known for her deeper perspective documentary essays addressing the human condition world-wide. Her work -- spanning editorial, fine art and documentary genres -- was most recently awarded by National Geographic with an International Photo Award, by National Geographic Traveler with a Best Travel Pictures Merit Award, and by FotoWeek DC with the Professional Journalism Award of Distinction. Her images have appeared in the Corcoran Gallery of Art, numerous publications including Black & White Magazine, PDN, National Geographic Traveler, NPR: The Picture Show, and featured in Photolucida's Critical Mass Top 50. Alsheimer is based in Santa Fe, NM. Photograph by Laura El-Tatawy. Heading to the field. I'll Die for You is an ongoing project exploring the epidemic of farmer suicides in rural India. "My concept has been focused on highlighting the peculiar bond between man and land. I found this relationship unique to farmers given their dependence on the land for livelihood & the equal reliance of the land on the farmers for survival. 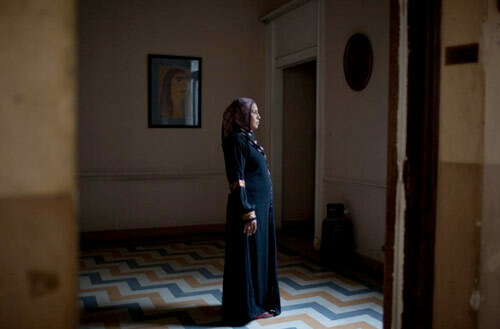 ..The work also focuses on showing emotional loss through a series of portraits focusing on the women left behind, from the widowed wives to mothers who outlived their children," said El-Tantawy. El-Tantawy is an Egyptian/British photographer living between Cairo and London. In 2008, she was nominated & accepted as one of 15 young photographers from around the world to participate in the prestigious Reflexions Masterclass, a two-year photography seminar directed by renowned Italian photographer Giogia Fiorio and French curator Gabriel Bauret. In 2005 she started work on her first book exploring the identity and change facing her native Egypt. In 2010, she started a long-term project looking at the epidemic of farmer suicides in rural India. Her work has been published & exhibited in the United States, Europe, Asia & the Middle East and she has been recognized with several international awards. Photograph by Diego Ibarra Sánchez. Chained in his cell at the shrine of Mia Ali Baba Shrine in Jalalabad, Afghanistan. According to local beliefs, the shrine has magical qualities to heal mental illness. The local shrine is located in a remote area controlled by the Taliban. Invisible Consequences of War is about the "abandoned, chained, and forgotten mental patients in Afghanistan. They "face a lack of resources to take care of them while the political instability and an increase of drug addicts, force them to be forgotten," said Sánchez. Sánchez, a journalist, received a grant from the Aragón Press Association that allowed him to start working as a photographer for the daily El Territorio and later for the Argentinian newspaper La Nación. He has photographed in Bosnia, Colombia and Algeria to document the reality of landmines and the stories of the Saharaui people. He has been living in Pakistan since 2009 working with Global Press News as a multimedia reporter. He is a member of Cordon Press/Corbis, an international photo agency. He is also one of the founders of ZPhoto, a collective that was born to create the Zaragoza Photo Festival in Spain. Photograph by Enrico Fabian. Employees do the final checking of generic drug ampules in a pharmaceutical production factory in Haryana, India. Phas Gaya: Being Stuck tells the story of Fakir, "Since my mother died everything has changed for the worse. If it wasn't for my two small children, I would have committed suicide a long time ago. These damn drugs, this damn medicine. " 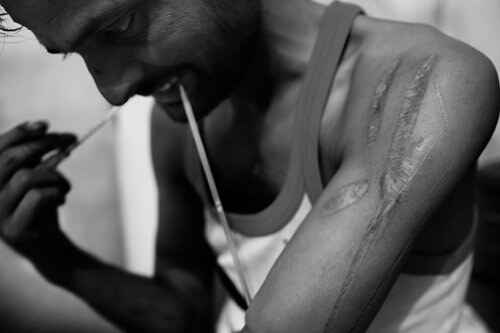 "For almost two years, I have documented the consequences of pharmaceutical abuse in India, with a special focus on an area in the outskirts of New Delhi. This new kind of drug abuse is related to the constantly increasing production of generic drugs in India - like an iceberg floating in a hot ocean, not meant for each other yet if brought together, so dangerous. Underestimated and widely underreported, it deserves attention on a level far beyond of what has been told so far," said Fabian. Fabian is a freelance photojournalist based in New Delhi, India. Photograph by Angelo Merendino. Celebrating our four-year anniversary at a restaurant in Greenwich Village. The Battle We Didn't Choose documents Merendino's wife Jennifer's four year-fight with breast cancer. "In September of 2007, I married the girl of my dreams. Five months later, Jennifer was diagnosed with breast cancer. Numb and in a state of disbelief, we entered the world of cancer," said Merendino. 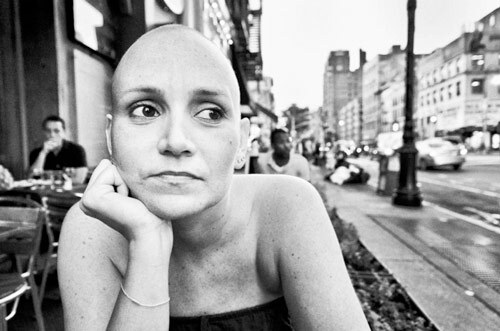 "My photographs humanize the face of cancer, on the face of my wife. Cancer is in the news daily, and maybe, through these photographs, the next time a cancer patient is asked how he or she is doing, along with listening, the answer will be met with more knowledge, kinder empathy, deeper understanding and heartfelt concern," said Merendino. Merendino studied photography at Cuyahoga Community College in Cleveland, Ohio. His photos have been published in magazines (Modern Drummer, Paiste News, Urban Dialect, Impose, Studio), featured on CD covers (The Vacancies, The Krank Daddies, Paul Fowler, Harlem Parlour Music Club) and posted on numerous websites ranging from a musicians life on the road to music and art reviews to product photography.